It’s back to school time across Oklahoma and that means thousands of parents and students alike have shifted out of their summer mode and back into more of a structured routine. Of course, as everyone is getting back to the routine and back to the books, it can also be a great time to revisit some important safety tips. Whether your child is in kindergarten, college or somewhere in between, GRDA wants them to be safe this semester. So, with that in mind, we are sharing some important “back to school” electric safety tips. Area schools are back in session so GRDA urges you to drive safely and watch out for these school buses and school kids on the streets. Also, we wanted to pass along a few more electrical safety tips to keep in mind this time of year. • Setting up a new computer workstation for homework, or maybe organizing your electronics in the dorm room? Do NOT nail or staple extension cords to walls or baseboard. And if any cords are frayed or damaged, replace them. • If you need extension cords in the dorm room, remember to use only cords which have been approved by an independent testing laboratory. Also, make sure they have been properly rated for their intended use. Finally, don’t run them under rugs or through doorways. • NEVER put a paperclip, a pencil or any other items like that into an electrical outlet. • For parents of younger students: Will your kids be walking to and from the bus stop or school? 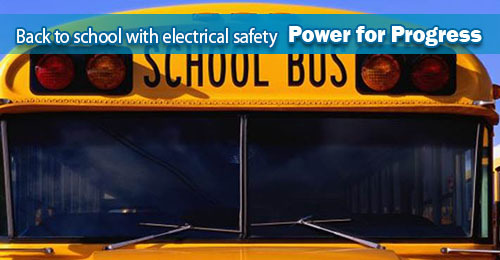 Make sure they know to stay clear of all high voltage electrical components along the route. Also, because Mother Nature or accidents can sometimes cause power lines to go down, make sure your children know to STAY AWAY from these lines. The ground around power lines can still be energized – up to 35 feet away. Also, NEVER touch or step in water near a downed power line. Your friends at GRDA want you to stay safe and have a great school year!